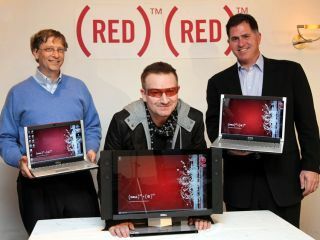 Bono has enlisted the likes of Microsoft and Dell to his RED campaign. Bono has frequently been praised for his humanitarian work, but not everyone sees the U2 frontman as a force for good. Those involved in a new online campaign are making one simple request: "Bono - retire from public life and we'll donate a ton of money to fight AIDS". This might sound like a ridiculous initiative, but the reasoning behind it is deadly serious. "Bono's philanthropy efforts are self-righteous, ineffective, and counter-productive," say the organisers. "The RED campaign [Bono was a co-founder] has managed to spend $40 million more on marketing than it has raised from RED product sales." The organisers also accuse Bono of presenting an "oversimplified and disempowered" image of Africa, before adding that "The grassroots leaders of the global fight against AIDS didn't ask for Bono to be their frontman". If you agree with the campaigners, you can join them in pledging money to the Global Fund to Fight AIDS, Tuberculosis and Malaria. However, pledges will only be paid if Bono retires from public life. At the time of writing, the campaign had raised $1,002.